The Superstition Fire and Medical District is a political subdivision of the State of Arizona, legally established in 1955 under what is now ARS § 48-261. The fire district was formed by a majority of property owners and registered voters, who petitioned the Pinal County Board of Supervisors to create a special taxing district for the express purpose of providing fire protection services to the community. Since that time the fire district has grown from one fire station to five, a Fleet Services facility, an Administration office, and a Regional Training Center. Along with these facilities came the need for additional staffing; with 89 public safety and 13 civilian staff the district has grown significantly since its origin. The fire district is located on the east side of the Phoenix Metro area in Pinal County in the state of Arizona and encompasses sixty two (62) square miles and serves the City of Apache Junction, the unincorporated areas of Gold Canyon, Superstition Foothills, Goldfield Foothills and Entrada Del Oro. A popular winter visitor haven the population fluctuates from 60,000 fulltime residents to over 86,000 residents during the winter months. Additionally, the fire district is home to the Superstition Mountains as well as numerous horse trail systems. Just outside of the fire district boundaries are canyons and lakes that offer water recreation and spectacular views. Fiscal management of district operations is provided by an elected five-member board, in conjunction with the fire chief who directs administrative and operational services. District operations are divided into four sections; Emergency Services, Community and Technical Services, Administrative Services and Financial Services each led by a member of the Senior Leadership Team. The district delivers advanced life support (ALS) and fire-related life safety functions utilizing a three-platoon system. Each platoon has an assigned battalion chief that directs daily operations with station captains providing supervision of direct fire and emergency medical services (EMS) related operations. Chief Farber has 37 years of experience in the fire service including the first five years of his career as a Firefighter for Rural/Metro Fire Department. Chief Farber has been with SFMD for the last 32 years. During his time in the district, he served as a Ladder and Engine Company Captain for 12 years, a Battalion Chief on C Shift for 8 years, the Assistant Chief of Operations for 2 years, as well as the Assistant Chief of Planning & Logistics and Fire Marshal. 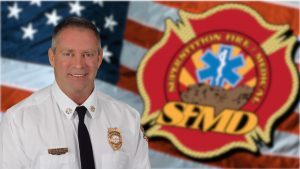 Throughout his career, Chief Farber has been an advocate of education in the Fire Service and has served as a member of the Mesa Community College Curriculum Committee and Fire Science Advisory Committee. Chief Farber taught courses at Mesa Community College and Central Arizona Community College in Tactics, Hydraulics, Supervision, College Algebra and Communication for over 20 years. He has traveled around the country on major Wildland Fires including the Cedar Fire in San Diego in 2003 and 2007. Chief Farber is certified as a Strike Team/Task Force Leader and Structural Protection Specialist for the Wildland Team for over 20 years. Chief Farber is the SFMD liaison for the City of Apache Junction Emergency Operation Center and developed several programs and policies for Pandemics such as, the Bird Flu that have been implemented for the City of Apache Junction. Chief Farber has always been active in the community and coached running backs and defensive backs for the Freshman Football team at Apache Junction High School. Chief Farber is currently on the Board of Directors for Horizon Health and Wellness and a member of the International Association of Fire Chiefs. Chief Farber has three daughters, one son (who is a Captain at SFMD), and six grandchildren.